Crossing Over by Paul Clayton tells the story of an American family trying to survive the beginnings of the second civil war. Set some time in the not-too-distant future, the existence of two simultaneous presidents has split the country along ideological lines. The protests are becoming violent, sections of the country have formed their own militias, along with the militias of the two warring parties. In the midst of shortages of food and other necessities, gangs and thugs are terrorizing formerly safe neighborhoods. 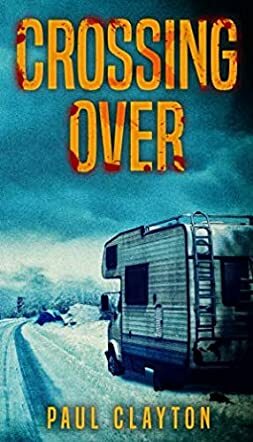 Realizing that it is no longer safe to remain in their home, Mike McNerney decides to pack the camper and flee to Canada with his wife, Marie, and disabled teenage daughter, Elly. Unfortunately, everyone else has the same idea. Once I started reading, I could not put down this well-written and compelling short novel. Clayton’s premise is chillingly realistic. The book does not focus on the politics, but instead focuses on regular Americans who not long before led totally normal lives, and who are quickly turned into refugees as they try to escape the crime and violence taking over the country. The scene at the Canadian border was highly believable, as was the deterioration of Mike and Marie’s relationship as it crumbled under the stress of their ordeal. Complicating matters is the need to protect their beautiful daughter Elly, who is naïve enough to wander off with any stranger. Crossing Over should stand as a warning to anyone inclined to think that violence is the answer to political disagreement, as it paints a picture of how America could slide into chaos far too easily. There is some mature subject matter and language. Recommended for readers who are brave enough to read it.